Galata, on the waterfront south of Pera, was the old, westernised commercial district of Constantinople, where the British consular and associated activities had been established by the Levant Company in the eighteenth century. Such property arrangements as the Levant Company, when wound up in 1825, passed to the British government were evidently pretty ramshackle. Captain Jones produced some drawings for new consular offices in the mid-1830s, but they went astray. Sick seamen were boarded out at Admiralty rates before a house in Pera was acquired and opened as a hospital in 1842. 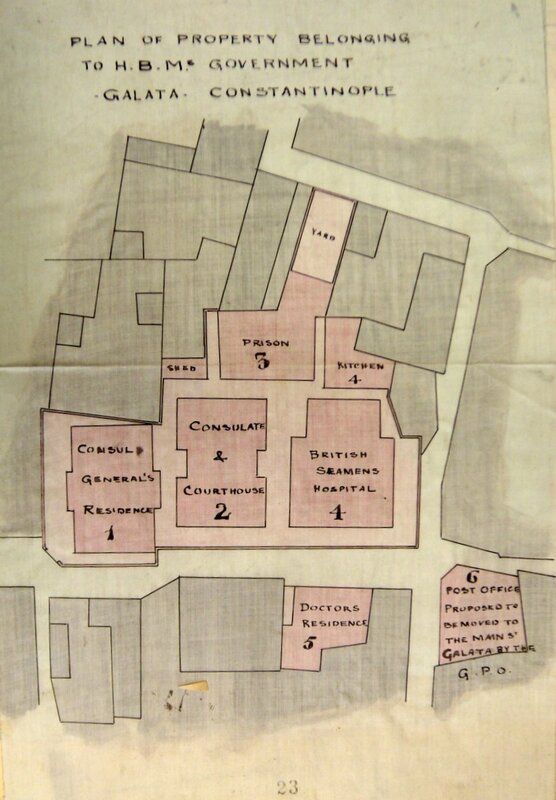 Three years later, William Smith submitted plans for a new small hospital, which the consul, Abraham Cumberbatch, commended to Palmerston, and he to the Treasury. It agreed, not least because it was thought that using surplus materials and tools from the building of Pera House would reduce the costs, but the project made no headway. In 1849, Smith found a suitable consular site in Galata, close to the Galata Tower and surrounded by a good wall, and this was bought the following year. Smith drew up plans for a hospital for 40 patients, for a similarly-sized combined consulate-general and supreme court building, both at the front of the site, and a two-storey prison behind, to cost in all about £10,000. The destruction of Cumberbatch’s house, which included the consular offices, by fire in July 1851 put pressure on getting building work started. Final approval, however, took until 1854 to come through and George Wood arrived in that year as clerk of works under the architect Henry Pulman. The buildings were erected sequentially: the hospital began in August 1854 and took nearly two years; the prison was built during 1856; and the supreme court/consular building began in February 1857 and also took two years. This building turned out to be too small also to house the consulate-general offices and so the adjacent site was bought in July 1859 from a hard-bargaining Mrs Mandella, who drove its price up to £3,700. The consulate-general offices and the shipping office, both designed by Pulman, were completed on this site in January 1861, the date upon which Cumberbatch laid an appropriate stone. 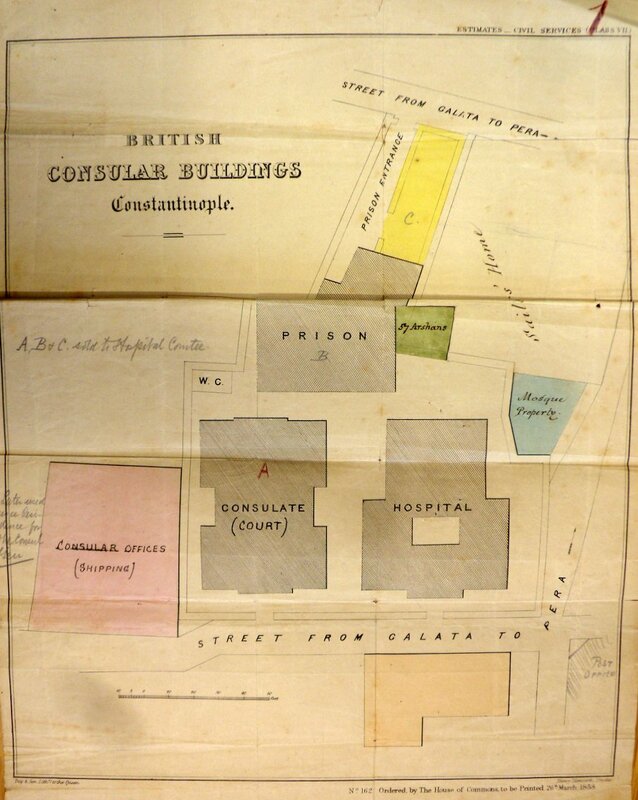 Meanwhile, three other pieces of adjacent or nearby land were added to the consular sites jigsaw: opposite the hospital in 1856 upon which to build a house for the surgeon; next to the prison in 1857 for a prison yard; and diagonally from the hospital for the post office. This somewhat chaotic cluster of buildings, in this crowded and rather disreputable area of the city, served as the consulate for the next forty years, though with decreasing acceptability. 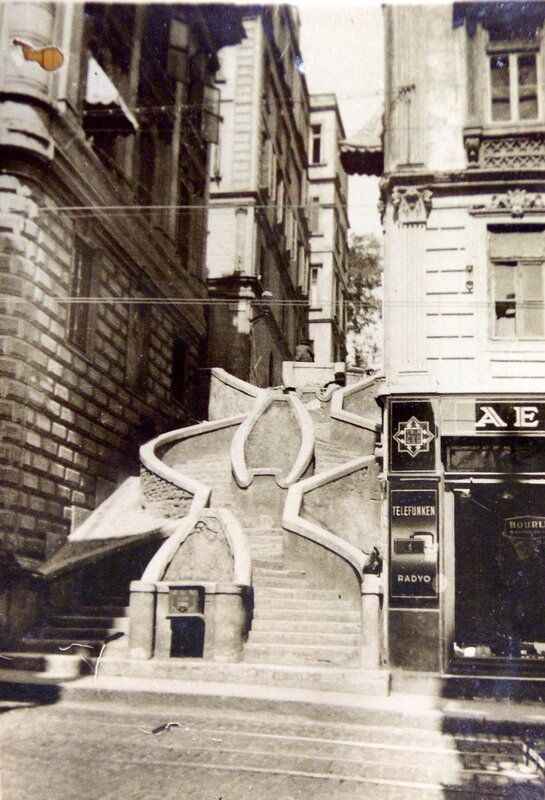 Even in 1870, when he inspected the Galata buildings, Crossman was unimpressed. He thought the gaol was ‘built on as wrong a principle as a jail could possibly be … The refractory cells are on the upper floor and in consequence great difficulty is experienced in getting drunken men up to them…’, and the hospital wards lacked sufficient ventilation. By the early 1890s, lobbying for new hospital premises had started in earnest by doctors, supported by ambassadors, but nothing both suitable and affordable came into view. Robert Boyce in London even played with plans for putting most of the Galata functions into the Pera House outbuildings. Then, in 1902, the Hospital Committee (chaired by Mr de Bunsen, Secretary to the embassy) formally presented a plan that it had been hatching for some while. It offered to buy the whole of the 1850 site at a valuation to be agreed; demolish the three buildings on it; redevelop the site as a modern, and larger, hospital; and re-house the offices and a smaller prison on sites to be acquired. Some adjustments had to be made to this plan but the whole scheme was broadly agreed by 1903. The Hospital Committee commissioned Charles Holden to design the new hospital, and he produced a plan with three limbs radiating from a central stair. The prison could just be fitted in behind. The consular offices were the most difficult to re-provide but a suitable five-storey former bank building [Societe Ottomane de Change et des Valeurs] was eventually acquired, and the consul-general took over the former offices for his residence. The post office closed in 1923 and was sold in 1931. The Supreme Court was abolished in l924 in accordance with the Treaty of Lausanne, and its building used for other purposes. The prison was sold in 1932, the consular offices in 1935, and the consul’s residence in 1944. The hospital lives on, its tower a noted feature of today’s Galata. Plan of consular buildings, 1858. 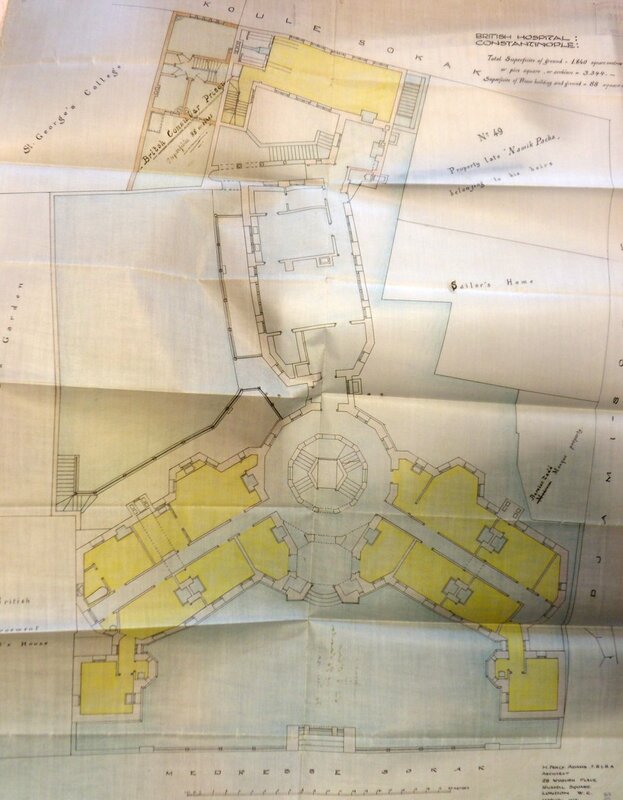 New hospital layout proposed in 1902 by Percy Adams. Street stair leading up to consul-general’s residence, with the offices in left foreground.